A party classic with an eco-friendly twist, our Paper Shape Packs are made out of biodegradable seed paper, and grow into flowers when planted! What better way to celebrate your wedding, birthday or special event? 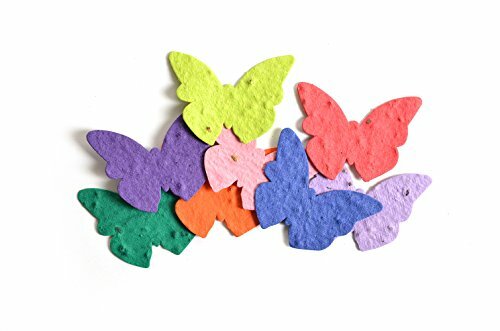 Each pack includes butterfly shapes (2.3x1.8") in a variety of colors. - - - - Plant for beautiful flowers; Five Spot | Candytuft | Baby Blue Eyes | Siberian Wallflower | Scarlet Flax | Zinnia | Sweet William Pinks | Corn Poppy | Spurred Snapdragon | Catchfly | English Daisy | Black-Eyed Susan| Forget-Me-Not - - - - Our artisan, handmade seed paper, craft paper and greeting cards are created by integrating some of the world's best practices in paper-making with our own homegrown innovations. Made of 100% post-industrial, recycled paper dyed with all-natural, vegetable-based pigments, in corn-based packaging, produced in a solar-powered production facility. Bloomin has perfected the centuries-old process of embedding seeds in paper to make greeting cards, thank you cards, craft paper and special items. Plant our seed paper for a garden to be enjoyed year after year, adding a little more beauty to our world. What you say, share, or celebrate grows! 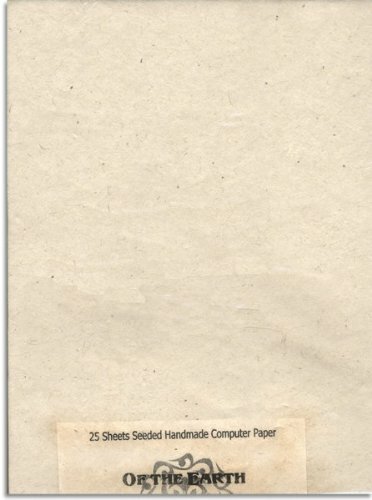 Send your friends or co-workers a note on these unique notes made of text weight paper. They can plant it in a pot or in their garden and enjoy seeing a mix of flowers and herbs grow. The paper is made in Nepal of recycled and sustainable materials using traditional methods and embedded with seeds. The notes are made and printed in the USA.Please note that this paper size may be too small to run through most printers. 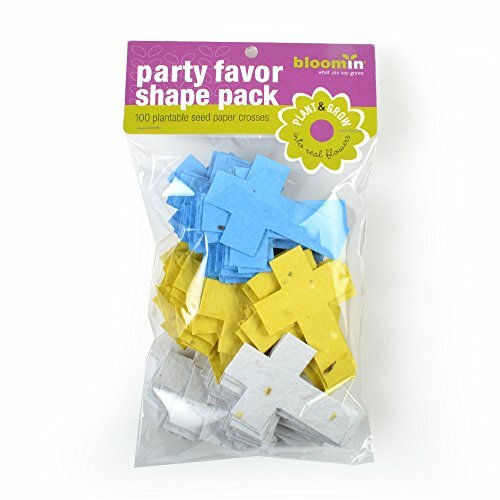 A party classic with an eco-friendly twist, our Paper Shape Packs are made out of biodegradable seed paper, and grow into flowers when planted! What better way to celebrate your wedding, birthday or special event? Each pack includes the Cross seed paper shapes (2x2.8") in a variety of colors. - - - - Plant for beautiful flowers; Five Spot | Candytuft | Baby Blue Eyes | Siberian Wallflower | Scarlet Flax | Zinnia | Sweet William Pinks | Corn Poppy | Spurred Snapdragon | Catchfly | English Daisy | Black-Eyed Susan| Forget-Me-Not - - - - Our artisan, handmade seed paper, craft paper and greeting cards are created by integrating some of the world's best practices in paper-making with our own homegrown innovations. Made of 100% post-industrial, recycled paper dyed with all-natural, vegetable-based pigments, in corn-based packaging, produced in a solar-powered production facility. Bloomin has perfected the centuries-old process of embedding seeds in paper to make greeting cards, thank you cards, craft paper and special items. Plant our seed paper for a garden to be enjoyed year after year, adding a little more beauty to our world. What you say, share or celebrate grows! 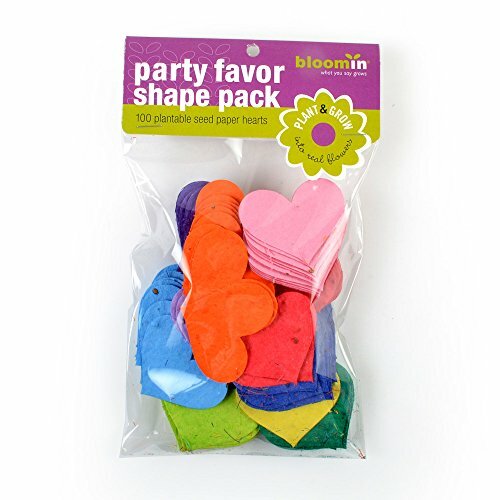 A party classic with an eco-friendly twist, our Paper Shape Packs are made out of biodegradable seed paper, and grow into flowers when planted! What better way to celebrate your wedding, birthday or special event? 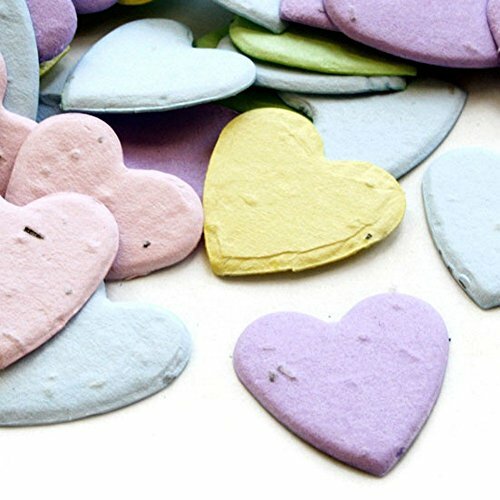 Each pack includes a Heart seed paper shape (2x1.6") in a variety of colors. - - - - Plant for beautiful flowers; Five Spot | Candytuft | Baby Blue Eyes | Siberian Wallflower | Scarlet Flax | Zinnia | Sweet William Pinks | Corn Poppy | Spurred Snapdragon | Catchfly | English Daisy | Black-Eyed Susan| Forget-Me-Not - - - - Our artisan, handmade seed paper, craft paper and greeting cards are created by integrating some of the world's best practices in paper-making with our own homegrown innovations. Made of 100% post-industrial, recycled paper dyed with all-natural, vegetable-based pigments, in corn-based packaging, produced in a solar-powered production facility. 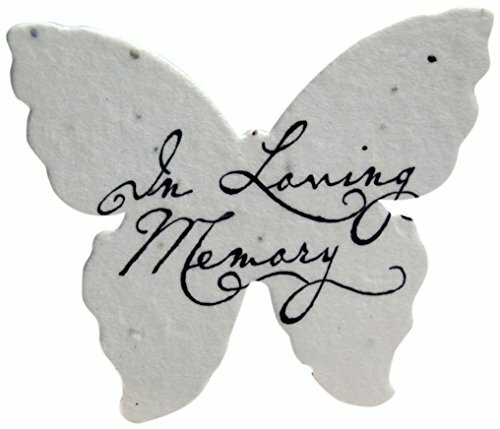 Bloomin has perfected the centuries-old process of embedding seeds in paper to make greeting cards, thank you cards, craft paper and special items. Plant our seed paper for a garden to be enjoyed year after year, adding a little more beauty to our world. What you say, share or celebrate grows! Perfect plantable seed confetti for an eco-friendly wedding or to use as eco-friendly baby shower favors. When thrown outside, the heart shaped plantable seed confetti will grow into wildflowers. It's eco-friendly, fun and so memorable! Size: 7/8in. in diameter. Package comes with multicolored heart shaped plantable seed confetti. All that is left behind is flowers and no waste. It's easy to plant and grow. The wildflower seed mix used in this confetti is as follows: Bird's Eye, Clarkia, Black Eyed Susan, Catchfly, Snapdragon, English Daisy, and Sweet Alyssum. This seed confetti has a one year shelf life. Sold as one bag that includes approximately 350 pieces of plantable seed confetti hearts. 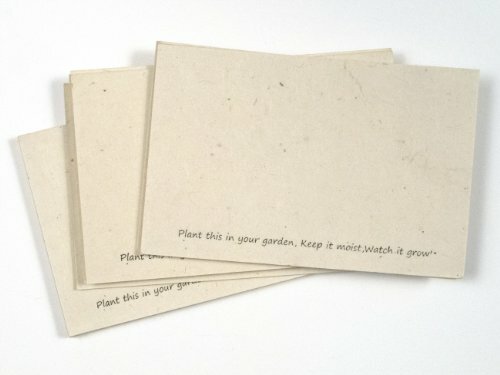 Want more Plantable Seed Paper similar ideas? Try to explore these searches: Eco Plastic Bags, Quick Stop 2 Brake Levers, and Cedar Fencing.